Disfrute y relájese como un local en un recorrido a pie y en cata por el centro histórico de Lucca. Obtenga una perspectiva interna de la cultura de los cafés de la ciudad mientras camina por calles estrechas y la emblemática Plaza del Anfiteatro con una guía gastronómica. Empápese del ambiente relajado y deténgase en varios bares y lounges para calmar su sed con vinos regionales, cerveza artesanal y un licor local combinado con bocadillos sabrosos típicos. Paseo culinario de 2,5 horas a pie por Lucca. Dirigido por un amable guía gastronómico. Our guide was young and full of information about Lucca! We strolled around the city while stopping first for a chocolate aperitif that was delicious! It was in the back of a small shop that sold wines, chocolates, pastries, etc. I wouldn't have known that in the back was a space like being in a cave! It was small and intimate! After a bit more history, we moved on to a bar that had a beautiful back area that was outside under grape vines and trees! It was happy hour so along with your drink came a variety of tapas. Our last part of the tour ended in the Piazza dell'Anfiteatro, an amazing place that used to be a Roman Amphitheatre. We had some local wine and an assortment of bruschetta which was absolutely delicious! 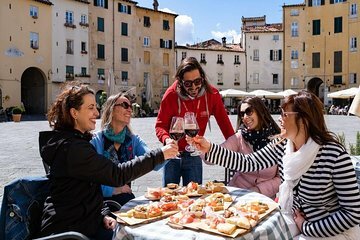 The combination of beautiful Lucca, delicious foods and wine and our knowledgeable guide Borana made this tour most enjoyable. Borana picked up on our special interests and adapted the tour for us. We waited 15 minutes for late arrivals which was annoying. Our guide was okay but difficult to hear at times and not particularly enthusiastic. Would not recommend as we were disappointed with the tour. This was a really great thing to do! We were the only two people and our guide Borana was fantastic!! She is friendly, spoke English well and has so much knowledge of Lucca, the history, the beautiful buildings and the special places to find. We felt she really made us feel relaxed and nothing was too much trouble for her. By the time we said goodbye we felt as if a family member was leaving us. We can definitely recommend this tour, do it and enjoy it- this is excellent value for money. This tour was very good. Our tour guide, Clare, very knowledgeable and we finished the tour with a wonderful 'snack' in the piazza .. with wine! I would take this tour again. Highly recommend it. The 'snack' consisted of meats, cheeses and bread -- actually, enough for a meal for me. An excellent tour for my special Birthday 60! There was only three of us on the tour, but despite this the tour still ran. The three of us was me, my husband and son. We had three guides who took us to 3 venues - one of which was amazing with grapefruit growing above our heads in the garden. Aperitif time in Lucca is great sampling all the best wines and food. We learn't a lot about what to look for in the quality of the wine and the florentino salami with fennel seeds is fantastic. When we got home I was amazed to find it in my local Lidl's store.